Although writing and photography, like so much of life, have largely gone digital, there’s still something useful (pleasant, even) about holding physical, tangible pages in one’s hands. So printers still have a place in the modern world. Whether you need to print out a set of reports for an upcoming business meeting, or you want to render your vacation photos on big, glossy sheets, there is a printer out there for you, and we’ve rounded up some of the best. Photography is an expensive hobby, and if you’ve invested a lot of money in a great camera, you may want a printer that can do your photos justice. While you can certainly drop a thousand dollars on a premium photo printer, the Epson SureColor P400 offers great prints without the need to tap into your retirement fund. With its unassuming facade, the P400 may not look like anything out of the ordinary, but it houses an eight cartridge system (seven colors and a “Gloss Optimizer”) that can create prints of “excellent color accuracy and saturation,” as we put it in our review. The P400’s seven ink colors allow for a rich variety of shades, and the gloss optimizer gives photos a slick finish that emphasizes the color saturation. The P400 can accommodate paper up to 13 × 19 inches, and while those sheets may take a little while to print (several minutes, according to our reviewer), the results are stunning. There may be photo printers with a higher ceiling than the P400, but casual photographers or those still learning the ropes should get the most value out of this entry-level beast. If you run a small business, chances are you need to print a lot of documents, and not just any printer will do. 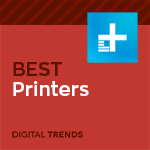 You’ll want a printer that works quickly (so you don’t have people forming a queue, grumbling angrily), and one that can handle the rigors of frequent printing without breaking down. Enter the Canon Maxify MB5420. With its compact, cube-shaped body, the MB5420 will fit in any office or house, and while it may not be the prettiest horse in the stable, it can pull a lot of weight. The printer can hold a hefty 500 sheets of paper (spread over two trays), and as we noted in our review, it can print monochrome documents at a rate of 22.2ppm (10ppm for color documents). Critically, it can also stand up to a heavy workload. The printer’s monthly “duty” cycle is 2,000 pages, which will likely be enough for any small business. As an all-in-one device, the MB5420 can do more than just print; it can also fax, copy, and scan, and as we said in our review, “our scanned documents exhibited accurate colors and fine detail.” While it’s not the cheapest printer in the world, the MB5420 gives you a lot of mileage for the price. If you want a laser printer for your home or office, the Brother HL-3170CDW is a safe bet, a compact device that you can get at an affordable price. This printer can blaze through jobs at a rate of 23ppm, and it holds 250 sheets of paper; both of these factors make it a good choice for offices, where people may need to print out a lot of documents without waiting for someone else’s job to finish. The printer isn’t just fast; it also supports duplex printing for double-sided pages. Whatever you print will probably look great, as it can print full-color documents at 600 × 2,400 dpi. Setting up this Brother model is a cinch, and in addition to its ethernet and USB 2.0 connections, it also supports wireless printing; users can connect with Android and Apple devices, among others. For most people these days, their smartphones are probably the main way they take photos. As such, portable photo printers are a nice accessory to have on hand, particularly if you’d rather hand your friends a tangible object, rather than just direct them to your Instagram profile. At roughly 3 × 5 inches, the HP Sprocket is svelte enough to carry in a pocket, with gently rounded corners and smooth edges for easy handling. To use it, simply pair it with a smartphone via Bluetooth, then launch the associated app. The Sprocket prints 2 × 3-inch photos, which may not seem all that impressive but make for fun, kitschy mementos. It also uses a nifty printing technology called “Zink,” which prints photos without the use of ink. Zink sheets have layers of clear crystals that, when activated by heat, produce color, so you’ll never need to worry about buying tiny ink cartridges. We’ve had great praise for other Pixma models in the past. Although the MX922 is a few years old now, like a Roman aqueduct, its sturdy design holds up — unlike its price, which has fallen. The MX922 holds up to 350 sheets of paper, making it useful for offices or people who simply need to do a lot of printing. The printer has both Ethernet and Wi-Fi connections, perfect for settings where numerous people will want to use the printer. An auto duplex document feeder makes copying a breeze. The MX922 also uses a five-ink system, and while that may not be the most robust color palette, it does result in good quality photos; the printer also sports a separate paper tray for photo paper, so jumping from printing report to printing photos takes no time at all.